Explore Chicago at your own pace on an independent bike tour. 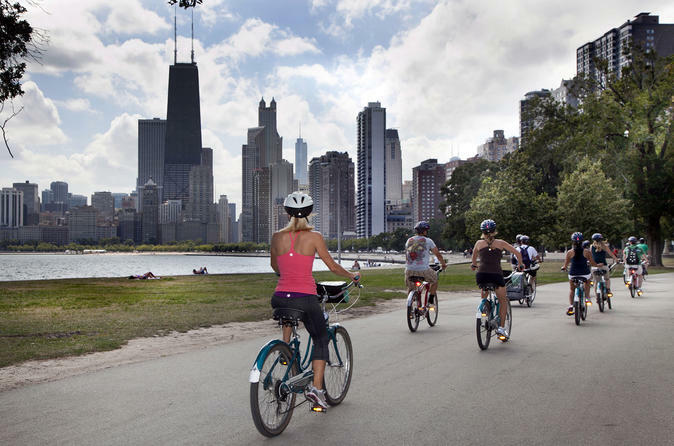 With your full-day bike rental, pedal along Lake Michigan and visit top Chicago attractions such as Lincoln Park, Navy Pier, Millennium Park, Wrigley Field and the Shedd Aquarium. This is a fun and active way to experience the city with the whole family, and you can enjoy the flexibility to create your own itinerary with the help of your provided map. You’ll receive a helmet, bike lock and detailed map to help you easily navigate the city. This full-day bike rental allows you to explore Chicago at your own pace. Choose from a variety of attractions and create your own sightseeing itinerary to fit your whole family's interests and preferences. Start cycling along the shores of Lake Michigan for gorgeous views of Navy Pier, featuring family-friendly attractions, entertainment, shopping and dining. Continue to Millennium Park, a lively gathering spot that's home to Cloud Gate (The Bean). Stop here to take a photo of yourself reflected in the mirror of this famous bean-shaped sculpture! Head north to Lincoln Park, a large lakeside community and park home to the Lincoln Park Zoo. Entrance is free, so you can hop off your bike to explore some amazing animal exhibits. Further south, you’ll find Grant Park, whose Buckingham Fountain stands tall as one of the largest fountains in the world! For a taste of Chicago’s passion for art and science, head to Museum Campus, a 57-acre (23-hectare) park on Lake Michigan that’s home to the Adler Planetarium, the Shedd Aquarium and the Field Museum of Natural History, as well as the Soldier Field football stadium. Of course, you can’t miss Wrigley Field, where the Chicago Cubs play! After your independent bike tour, drop your bike off at the rental shop by 5pm.